I have only been on the Memory Formula for a few days, but can already see an amazing difference in my mental abilities. Not only do I remember lots more, I feel much more positive about almost everything. I am cheerful and upbeat most of the time now. I am crippled myself, and my husband lost both his legs two years ago, and I am his caregiver. Our whole life changed, and now coping is much easier. Thanks for this product. I do not want to ever be without it. I take two every day and never skip one day, I find it to be helpful in my daily thoughts regarding getting my day complete. Advanced memory formula is a great product. From the first month I fell the difference in my brain, better oriented, clear mind, and improved memory. I started taking Advanced Memory Formula in 2009 along with my dad, who was struggling. It seemed to help my dad. He appeared to be more able to collect and communicate his thoughts. I know it has helped me for the past 9 years. In that time my life has been filled with stress and changes, - a lots of unwanted changes. The aftermath of a catastrophic flood which created a new normal at work with no privacy and then most difficult of all- learning a new computer system at work. I have consistently been able to count on my brain and memory. It didn’t make me learn the computer program any more quickly, but I was able to remember things that are less foreign than the computer system. Thank goodness. Advanced Bio is a good place to start for healthy,natural ingredients for clean supplements for physical needs. At age 93 I would expect to forget things in both the recent past and the distant past. While there could be some of this, it is usually very small details or very many activities or people. I think it is doing some good because I'm beginning to remember words a bit faster and words that I seem to have forgotten. As a 53-year-old student, I have found that my mind is not what it used to be and I have been struggling using everything under the sun to help. Until I found this formula in less than a month I already feel better my thinking if coming back. Do you know what it is like to tell someone something get in the middle of the sentence and not remember a word and what you were going to say? It is returning again!!! Most supplements are all about hype, but Advanced Memory Formula seems to make a difference for me that is noticeable. This supplement seems to be effective even after only a week of use. I noticed a lot of good memories coming back to my mind and have really enjoyed the clarity. I have taken this for two months now and feel a definite improvement and assurance in alertness. I don't know if it is helping or not. I know it isn't hurting. I still have trouble remembering some things. Maybe I haven't been taking it long enough. I have tried just about every brain booster supplement on the market, but the only two things that helped are Advanced Memory Formula and Cod Liver Oil. Without those two my long and short term memory is really bad. So thanks for this great product. The best supplements I ever had; my muscles feel stronger than ever, my energy level is up plus my memory is sharper every day. I guess it might be helping. I haven't been taking it long enough to know for sure. It is a great product, everybody should try it. My mind is more grounded, better oriented, my memory improved a lot, still I need to improve the short memory. So far I am very happy with the results. Thank you for all you do to develop a good quality products that really work. I was taking some of the ingredients separately until I stumbled upon Advanced Memory Formula, which contains every thing I was taking and more. For me it has been a life saver. I tried just about every memory boosting product on the marked with zero results until I found Advanced Memory formula. It gave me an immediate boost in mental sharpness, long term memory, and short term memory. This is an excellent product. There are many products for memory on the market today, but I believe Advanced Memory Formula is top quality and produces results much better than other supplements that I have tried. After just a few days of starting it I noticed improvements in my ability to concentrate and think more clearly. And whereas before I had suffered from morning brain fog, this almost totally erased it. I began taking this supplement about a month ago. It took a couple of weeks before I noticed any changes, but now I can say that it is working as promised. This is a product that I will continue to use. It gives me much better clarity and I even seem to have much more energy. This product combination definitely has improved things for me. It doesn't turn back the clock but definitely improves memory and stability. I have tried other products, but I've found this one comprises the most complete formula with all the ingredients that help me to stay as mentally sharp as I possibly can. Other products simply do not have the combined vitamin, herbal, and mineral content designed to support memory and mental acuity that Advanced Memory formula contains. I believe it has helped me to continue doing rigorous work that includes a large amount of reading and writing. I feel confident in recommending this product to anyone looking for support for well-being while aging as well as memory support. I bought this product because my memory was starting to fail me , Not remembering the names or flowers and scaffolding ect . I would look at these things as says now what is the name of this ??? I knew the answer but couldn't say the name . I started taking the advanced memory formula and within a week , I started feeling a difference and remembered names , ect . It was a big boost to my self . I would recommend this to everyone. I love this product, I feel sharper mentally but unfortunately I cannot afford it, too expensive for my budget. But I definitely recommend it!! Now and then and then again I was forgetting the name of small things that I knew what they were but the name escaped me. I found that the nine elements of your Memory Formula helped me. I am into the second week and I still find a loss BUT it comes to me after reflecting a moment which, of course, indicates to me this stuff REALLY WORKS. I now have 9 new 'friends'helping me solve this aggravating problem. I am happy with Adv Memory Formula due to the excellent ingredients. Just started taking them. I was experiencing fogginess in my thinking and since I have been taking the Advanced Bionutritionals, it has been clearing up. I intend to take these pills as long as possible. I have tried several different memory products in the last few years and really like Advanced Memory formula. It makes me feel better all over and seems to make my whole body respond well. It does help my memory if I lose a thought give myself a min. or two the thought returns. I would recommend it to anyone. I am in a job that requires contact with the public. To my surprise upon seeing people that I had not seen for more than 20 years, I remembered their names. One person it was her facial twitches that triggered her name to me. I am 77 and plan to be on this product for a good many years to come. I like Advanced Bionutritionals very much, and I like all four of your doctors very much too. They are all very competent, and are doing a very good job. I take a large amount of supplements daily. I try to buy the best, not overly priced , overly advertised products. I will say that I believe your Advanced Memory Formula has helped with some of the “Why did I come into this room?” I will renew this product very soon. I am using this product to see if I can recapture my clearer memory. I am almost 82 and finding it more difficult to recall memory moments. I am hoping this product will help. It is too soon to tell. I have hope after reading more items about aging memories. My memory has really improved since I started taking Advanced Memory Formula. I highly recommend it to everyone. I started seeing results within three days after taking Advanced Memory Formula. I had found I was having trouble recalling words and events but that has improved immensly. I find I can have a conversation without stoping to find words that come to me easily now. Thanks for this amazing product! I switched to yours because better deal and suprised to find works better. Bought this for my husband & it works so well for him I started to take it also. Living up to its' reputation, what more can I say! I started taking the memory formula and I noticed a big improvement in 2 weeks and it has gotten better after the first month. I continue to take it and get wonderful results. I told my friend about it and she didn't think it was working very good, so I asked her how she was taking it. She said 1in the morning and 1 in the evening. I told her to take them togather in the morning like I am doing and she told me things started working for her. This is a re-order. My 92 yrs old mother had been taking it. Now her geriatrician thinks there is nothing wrong with her hippocampus and there is not much deterioration since 2008. I noticed that when I stopped taking the product my short term memory got much worse. When I restarted the product, it much improved. Predisposed by heredity. Noted age related decline was halted or lessened with continued product use. I will be 84 in June and live in a retirement community. However, thanks to this product, I am still teaching at a local university. My third book was just published. People in the various groups to which I belong count on me to be the "rememberer" of various events and appointments! I am extremely grateful to Advanced Bionutritionals. After several months on these products, I have found that I can remember even names formally forgotten ! Great. ! I have tried both ways, with and without and definitely notice a difference! I have been using the Advanced Memory Formula for almost a year and have noticed a remarkable improvement in my short term memory and recall of events and dates from the past. I am 78 yrs. old and understand that at my age it is normal to experience moments of forgetfulness but I do not accept it as an unavoidable cause of aging. So I started taking this supplement and am very pleased that it is working for me. I plan to continue taking it the rest of my life! My memory has improved markedly over the years I've used the product. I bought this for husband because he can never remember much of anything except work. It has been working quite good for him after taking about a month. Thank goodness, will keep on buying this for him. I had taken this product before and didn't renew it. I started having memory problems again so decided to reorder. It helps me with remembering names and how to do my day to day errands ' I have less "senior moments". In the 4th week I feel my brain grounded, normal orientation, improving memory speed and mental focus. I will continue taking this Advanced Memory Formula and I recommend this supplement from Advanced Bionutritionals. Thank you for your dedication to develop a great product. I fine a great difference in my memory /mental performance if I don't have it !! However I can afford only one bottle a month now. Glad to receive one with discount! Which means I don't need a shipment until March?? Great product! It is easy to take , in a few days you concentration gets better. I have ordered the Advanced Memory Formula for my dad for years. We order 3 bottles at a time and he always has me reorder when he's close to the end of his second bottle. He makes sure he will not be without it. He turned 90 today and his mind is as sharp as ever. this supplement greatly helps the very debilitating brain fog I get after meals. And it helps my memory and thinking lots. I’ve been taking Advanced Memory Formula for years. I felt my memory slipping in my mid forties, so I started taken the Memory Formula and my memory returned to normal. I’m 59 now and I will never stop taken the Memory Formula. I am of a certain age when I cannot ignore the fact that many of my peers have had serious health concerns. I am an organic gardener, maintain my weight. 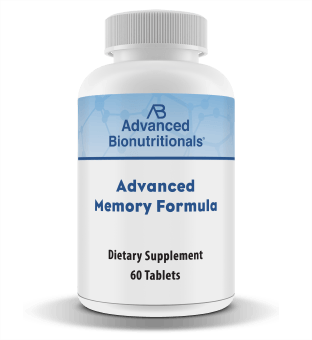 I take Advanced Memory Formula (having switched from another brand) because it contains what I believe are the best ingredients to enhance memory and avoid those embarrassing so called senior moments. I haven't noticed any clear indications of change; however, I haven't burnt the beans lately, and seem to be holding my own with my husband who is nine years my junior. I will continue to take this product and will report back when I turn eighty and hopefully will have published my novel. I have found that I have been remembering things and peoples names better than I have in many a year. I thank you for this product. I will be ordering more! Before discovering Advanced Memory Formula, I tried several others. All worked to a certain extent, but Advanced Memory Formula was clearly superior. I am 83 years old, and both short-term and long-term memory functions are right there at my command, every time--especially names! My friends often count on me to be the one to remember an event, a date, a word. I am still teaching at a university. I am using and feel better. Have excellent composition formula. I recommend it. Nothing's going to erase the ravages of time. But this product has helped me put it off a bit. When I turned 70, I noticed that my memory and attention were not as sharp as they had been. I was impressed by the description of Advanced Memory Formula and decided to try it out. Very soon I felt more focused, but I didn't know if I should attribute this to the formula or to other things I was doing: brain games, changes in diet, exercise, etc. I live overseas, and one time I used up my stock of tablets before the next shipment arrived (my fault, not theirs). During that 2-week gap I found myself getting foggier and foggier, and I panicked. Then the formula arrived, and in less than a week I was back on track! Words cannot express how grateful I am for having found this product. I feel a definite improvement remembering things and an improved ability recalling activities I was involved in. It was suggested to me by a friend that I went to college with, and now that I am over 65, I do understand that we put so much in our brains that it isn't easy to remember everything, but I am glad to keep trying with the help of a supplement. I like it because it include all vitamins that is usually recommended to slow down the process of memory loss. I tell all my friends about. Excellent result with Adv Memory Formula after a week.! I am 66 years old and have been taking this product for about 4 years now. I am a retired computer programer and in the last 3 years I have been able to write programs again. I thought for a while my past life was over but I have been given a second chance. Thank you!! I was having memory lapses when I eas driving and would lose my sense of direction and how to get where I was going. I started taking the memoey formula and those decreased and now they are completelt gone. I also seem to remember things better, am sharper. Am in my mid eighties and have used Memory Formula for about four years. I think the way memory works for us olders is that it is more difficult to make a memory than when we were younger. Memory Formula makes it less so as we move through the day. Many frustrations of our best years, now, are eliminated with this very effective aid. Try it. It works. I will recommend Memory Formula to a friend. I will recommend it to my enemies, because if they try it we will be friends. I've stopped it several times and noticed a marked difference in my memory and focus. Then I met someone in the medical profession who researches products that help memory. He gave me some "inside" information saying I need to take 10 mg. of vinpocetine daily because of the research that shows how well it helps memory. I went home and looked at Advanced Memory Formula and found that it contains 10 mg. of vinpocetine. So I continue to take it with great results. I had much more awareness and could recall so much faster than before taking this supplements. I take one about every other day. It has helped my memory immensely. I'm very thankful for more energy and clearer thinking. Thank you. Great Company providing exceptional products with wonderful Customer Service. I will definitely recommend Advanced Bionutritionals to family and friends. There was an "issue" with my order which was totally MY fault, but Advanced Bionutritionals fixed problem at their expense. Thank you so much! I took a memory supplement from another supplier, but they changed their ingredients. I noticed that there were memory lapses, so I decided to take Advanced Memory Formula. The symptoms went away after taking AMF for a couple of weeks. I am glad that I made the switch. Due to being hit by a car 10 years ago while walking in a crosswalk, I encountered multiple injuries including a traumatic brain injury. One of many things that helps keep my mind challenged & sharp is doing brain games. Since I've started taking Advanced Memory Formula, my scores on the different cognitive games have improved enormously. There's no question I will continue taking this supplement indefinitely! About six weeks ago I experienced an entire week of forgetting common every day things, and it scared me terribly. I did what I believe most do in such a situation and told absolutely no one. 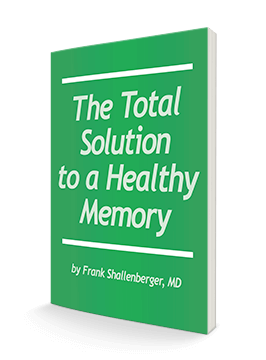 Fortunately, I had a recent newsletter from Dr. Frank Shallenberger about what to do for memory loss and immediately ordered his Advanced Memory Formula. I have nearly finished my first bottle and am beyond pleased with the positive changes back to being "on top of things". I have always had a very detailed mind and am so blessed to be back to where I was before that awful week. And I never expected it to work so quickly. I am so grateful. I have used Advanced memory for about 5 years - At 86, my memory is considered remarkable by my friends and familly. I have used Advanced Memory for the past two years and I haven't seen any decline in my memory. I am in my 80's and can say I am really pleased with the way my memory functions. I only wish my physical body was as sharp as my mind. People think I am in my 60's as I function as a much younger person. Thank you for this product as the contents seem to be a winning mixture. I was starting to search for words and forgetting things. This was disturbing, so I prayed and also began to search for a good natural supplement. This seemed to be a unique and good formula. After a short time I improved and feel like normal. I have continued with 1 tablet a day. It has worked for me. I have been taking this supplement for over a year and can't do without it. I can tell when I have missed taking it. I would definitely recommend it to anyone having senior moments! Almost every person over 80 should be using this. Sure helps me. I've been taking it for several years, it works great, I recommend it to everyone. I have taken this for about a year just before bed and it seems to work. Not hard to digest even on an empty stomach and easy to swallow. I have probably used Advanced Memory Formula for over 15 years and don't ever plan to quit. If I skip a couple of days I start wondering "now why did I come in here?" I am 74 years old and with Advanced Memory Formula I have a memory better than my 48 year-old daughter who should start taking it herself! I have been taking it for about a year. My memory is good. As I am 80 years old and don't have any problem remembering things I guess it is doing a good job. I have used this excellent product for 4 years. I can certainly notice the difference even in a day, if I have missed taking it. I always feel well, and in top mental form. I've used several memory formulas and I'm finding Advanced Memory Formula noticeably more effective than ones I have tried. I also appreciate the absence of side effects. Haven't been taking it long enough for a thorough evaluation, although it does seem to be improving my Memory, as far as names, and crossword puzzles.....Still on first bottle! My husband and I tried the first bottle so Im waiting for the next one. I'm a very busy mom, with 3 teenagers and a very busy husband who owns his own company. Many irons in the fire at all times and everyone relies on me for every appointment, sports, events private and corporate, etc. i've found the advanced memory formula to be a life saver that keeps me focused and on my game. I definitely notice when i don't take it. i've already recommended it to friends and family. Thank you so much. I have been using this product for over a year and assume it has helped. I found even better resalts using alpha lipoic acid in conjunction with the Memory formula. I think it's working but have only been taking for 3 weeks. I've not been taking this a long time but I have noticed some improvement. Everyone is different, so the results will be different also. My husband and I have been taking Advanced Memory Formula for a couple years. We noticed a significant improvement in our short term memories after taking it only a month. There were a lot less Senior moments! We can assure you that it works to improve memory and mental sharpness at the recommended dose of two tablets each day. I have been taking the Memory Formula for a year now and I can tell my memory has greatly improved. This a good product. I was some what foggy at times and started taking this supplement and my memory has improved somewhat. The sure term memory is still absent most of the time. Hopefully it will improve. After taking the pill for over 6 months we feel they have made a positive improvement in my husband's memory issues. Seems to be helping me after starting the second bottle. Improved short term memory, less brain fog. My health has definitely improved over the last couple of years, which I partly attribute to AMF. Had I taken ONLY AMF I could speak more specifically. However, I have been learning about all kinds of new approaches to good health, and taking many new supplements in that time. AMF is one I definitely wouldn't want to do without. Thank you for continuing to educate people. I had been using another product, but wanted to improve my mental edge even more. Since Ultimate Bone Support had proved itself with improved hard evidence (DEXA scan) I figured the memory product would do so, also. Retrieval of words can still be problematic; however, I do believe there has been an uptick in memory overall. This situation varies so much from day to day due to many factors, especially how much sleep I've gotten, that it can be difficult to say specifically. I do think it is worth a serious try. Appeared to help with my memory. I also have my husband take it, but he says it didn't really help much. We will continue to take and see if it helps more on an extended period. I don't like the taste and smell of the tablet though. Hope something can be done about that. I think the ingredients in this product are good for me. It has the ingredients required by many professionals in that field. I don’t have a problem with that yet, but hope it will assist in my keeping my memory sharp as I age. I take two other memory support products, but believe the combination is helping me. I will continue with the memory formula. I have been delighted to find a supplement that icludes nearly all the ingredients I was taking to improve my brain function. I have found my abillity to manage day to day functions has improved greatly. Im now enjoying life a lot more. I have told several people about the Advanced Memory Formula. I have noticed that recall of immediate past events happens much more readily with this product. I believe the GPC is a big part of this. Mental clarity is generally improved. I realize individuals vary greatly, but I think anyone with memory issues would benefit from this product. I have not been using the product for very long but I feel that it shows a lot of promise in helping to keep and maintain my memory. I would definitely recommend this product to seniors. I am 80 years of age and found I did forget important information. Since my wife and I have been taken this supplement our memory has improved. Thank you for making this product available. The supplement definitely helped, but when combined with phosphatydylserine (PS) it really helped. Can definitely tell the difference in my recalling of names, facts, and places. IT WORKS !!!!! this product and cod liver oil are the only two products of dozens that I have tried which actually improved my brain function. I have been taking it now for more than a month, and was hoping to get back some of the quick recall I had as a younger man. (I'm 64 now) Thus far into the bottle, I haven't noticed any difference. Mind you, my wife and I do a lot of the 'right' things to improve everything anyway. We eat organic, local and real food only. Don't know how well it works compared to other products. I have purchased Adv. Memory Protection for several years and find it very effective...when I am without I know the difference! I was skeptical when I ordered this but I think it has definitely helped my memory and my focus (which I expect go together! This is a balance nutrition for memory system, it doesn't help much for recognition, but it does work for short term memory. I'm 75 years old and have never had a real good memory. After 2 weeks my wife and myself have been surprised at some of the things I can recall. I have ordered this product due to the number of ingredients that it contains for memory improvement. Instead of taking several different ones, You can just take two of these. After medical events I have struggled with memory issues for 9 years. After two months of taking Advanced Memory Formula, I began noticing my ability to remember detailed information had improved dramatically and consistently. However, I notice there are times where I again have difficulty remembering names and facts. I hope the supplement will continue to work as I ordered another 90 day supply and feel generally this product works well with no noticeable side effects. I started taking this Memory Formlar immediately after I received it on Sep 27, 2016. The bottle states "for maximum benefit, use for a minimum of two MONTHS. It seems as though my memory has improved some, but I'm not sure because I take other supplements, for instance NITRIC OXIDE. I like it. It work's. I use for a month then stop. Then a month. I ordered Advanced memory Formula in the hopes it would help me remember peoples names, where I put my keys down at last, etc. I have only used it for about three weeks and I have noticed a positive difference in my remembering people names. I cannot still remember where I set my car keys down but there is hope. Any gain is a good one at my tender young age of 65. I would give it a shot and order. Remember, (no pun intended), there is a complete money back guarantee if the product doesn't work for you. I tried the product and noticed a good noticeable improvement in 2 months, so far I have recommended this product to my mom, my sister's family and my friends and patients. After two weeks I noticed a feeling of wellbeing and a new motivation in my daily life. I have been taking Advanced Memory Formula for over two and a half years now. Since I started taking this supplement I had the distinct impression I was more alert than before, noticing far more details in my surroundings without paying special attention to them. A friend of mine I gave this supplement to, to try it out, said that although he could not be sure, he too thought he became more clearheaded. I forget less. Make fewer errors in routine. Never leave stove on. Am now keeping myself more active and on time. Fewer errors in routine. And notice I am still improving. I remember to do things on time and as needed. I remember my schedules and plan ahead so I don't miss any events with my friends. And I am only 86 yrs young. At age 76 I am in good condition and mental in good shape as well in the head!!!! The product was good, but to expensive. You can find one with same ingredients online at half the cost. I can't tell any difference since I started taking the memory supplements. You asked me for a review. I have used the product for some time now and my memory is still quite good. I am also giving it to my wife who has memory problems, but cannot say if she has benefited from it. Will go on buying it in any case! I really don't see any difference, but I keep doing it just in case it might make some difference, or somehow slow things down. I started my wife on this product, there may be a little improvement. What i have observed with memory is a lack of vitamin B12 and folate, in most studies. I am also aware of coconut oil to help. I believe you may have documented a doctor who used 4 teaspoons a day on her husband with great results. After one month, no improvement seen as yet! We are hoping to see improvement in the next 60 days or so. Thanks for the opportunity to try it! I’ve been using the Advanced Memory Formula for over 6 months and have no identifiable difference in my memory. Of course, it’s possible that it’s prevented a further loss of memory, so I ordered another 6 months to give It a second chance. Nevertheless, I am expecting to see some improvement this time, or I’ll try something else. I have only taken the supplement for a relatively short time, and cannot say that it has had any discernible impact as yet. I ordered enough to give it sufficient time to bring about the intended effect. It seems to be improving my memory I am able to recall more things. The results I thought would happen faster but I will wait and see. I've been taking the Memory Formula for just a few weeks and unfortunately have noticed no improvement in my word recall that troubles me. I'll wait a while longer before asking for a refund. I can't tell any difference since starting this Brain Product. I will keep on, since I didn't expect to notice much change, and I hope it will keep my brain in good working condition. I can't tell any difference between this formula and any of several others from different manufacturers that I have taken. At least I don't feel that I am forgetting more often. In general I like Advanced Bionutritionals but feel that the products and I really dislike their practice of upselling. My wife likes this product, she has more memory problems than I. I have been using a different product and adding the Memory formula made no significant difference. Not sure it's helping with memory. I have been diligent in taking it. I am returning the order. this product is helpful, however I prefer a capsule, as the tablets are harder to swallow and don't break up as easily in my body. the supplement has some slow reactions and I am not sure I am getting a big change. But I am remembering what I forgot on my shopping list. Although this formula is helpful, I needed something stronger. So now I take 2 different formulations to keep my mind alert, especially while driving. I've taken Advanced Memory Formula for several months - hoping to see an appreciable difference. But no noticeable improvement. I have had only a slight increase in memory so far! I had hoped for more! Neverles, I will finish the bottle and decide if a reorder is. right for me! I have a hard time remembering names. Otherwise I can get by. I am 82 years old. My wife is 79. and has a harder time remembering things, So far I have not seen much improvement. I have seen no improvement in my memory. Will be checking on other options. I have not experienced any definite improvement in my memory since using this product. I am age 92 so I guess if it keeps me from getting worse that is beneficial. I haven't noticed any improvement so far. But I've only been taking it for a few days. To be fair to the product, I'll take it for a month before I decide if it works. Can't say this is helping me, will take for another 2 months before concluding whether it helps. After takeing this product I can't tell that it has helped.Not worth what I paid for it. I have tried a lot of things to help my memory. This was no help whatsoever. I had no improvement in my memory whatsoever. Bummed. This is the second time that I have ordered Advanced Memory Formula. So far, my memory has not improved. I have been using Advanced Memory Formula for about six weeks and i can see no difference. In fact, I am in the process of sending back all of the bottles I received from you to receive a refund. I have not noticed any difference in my memory. I am dissappointed. I've been taking the product for a long time and don't notice any difference in my short or long term memory. No improvement. Nothing happens, Memory failing more everyday. Noticed no difference after 5-6 bottles. I returned your last delivery for a credit. So far, in the dosage recommended (2/day), this supplement has not made a difference in my memory level which has been bad for recalling names and dates since decades ago, but I am of the belief that the body is completely interconnected and thus while I struggle with other health conditions, as is the case with blood circulation / iron transportation of oxygen to the cells, etc., it is quite possible that my memory might not improve until those other conditions get resolved. I took the whole bottle but noticed no improvement in my short term memory (especially names). I am 81 and wonder if the problem is my age. He has been taking 2 tablets a day, but I haven't seen any improvement. Do not feel this product has done anything for me. My husband has been trying to remember to take these pills (placed abutting his normal pills which he does remember) I see little to no noticeable improvement. We will continue to take them to see if dealyed improcement may be coming. Take it as suggested; haven't noticed any difference. Double blind study shows no difference. A waist of money. Unproven in an independent trial. The ingredients are nothing out of the ordinary and a good diet would be more important. * Above are actual reviews from our customers. These customer’s statements may not reflect the typical purchaser’s experience and are not intended to represent or guarantee that anyone will achieve the same or similar results. The reviews should not be taken as the results a typical user will get. Your results may vary. This cutting-edge formula gives you nine powerful, well-researched nutrients shown to support mental performance and protect your brain health as you age. 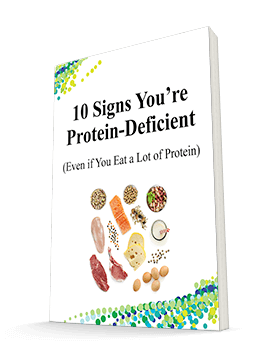 These ingredients include bacopa, vinpocetine, phosphatidylserine, luteolin, and blueberry. Advanced Bionutritionals® products are manufactured in the USA from globally sourced ingredients by Formulation Technology, Inc.